Know and live by NMMI standards of conduct and personal appearance. Demonstrate self-control, self-discipline and personal accountability. Adhere to the Honor Code, displaying ethical and moral behavior. Become a productive and supportive team member and a patriotic citizen. Become culturally aware, display respect and consideration for others and embrace appreciation for diversity. Develop excellent time management skills, a positive work ethic and an eye for attention to detail. Demonstrate respect for authority, military bearing, and social etiquette. Demonstrate positive character development and personal integrity. Successfully live in a shared community environment, develop a healthy lifestyle and habits. Make the right choices and avoid high risk behavior. Demonstrate knowledge of NMMI customs and traditions. Become a positive leader with an understanding of authority, responsibility, and accountability. Ensuring the security, safety, health and welfare, physical readiness, accountability, mentor-ship, and leader development of every cadet. Maintaining a positive leadership environment and a culture of discipline in which each cadet can achieve academic excellence and physical readiness to maximize their potential. Establishing the military structured environment and overseeing the disciplinary system and disposition of disciplinary issues. Overseeing the military training, community service and interaction, extracurricular and intramural activities, entertainment and most activities affecting daily cadet life. Overseeing the Honor Code system run by the cadet Honor Board. Overseeing all cadet services through the Deputy Commandants including the infirmary, Post Exchange, dining facility, barber shop, cadet store and laundry. Daniels Leadership Center, the Ropes, Leadership Reaction and Obstacle Courses. Cadet Counseling Center and services. The Commandant is supported in his duties by two Deputy Commandants; three Squadron Leadership Advisors (SLAs); three Counselors including a Chaplain; a Leader Development Counselor/Instructor; Protocol, Cadet Activities and Entertainment Coordinator; an administrative office staff; the staffs of both Junior and Senior Army ROTC; the Campus Police, Medical Staff and the Troop Leadership Advisors (TLAs). The Troop Leadership Advisor (TLA) is directly responsible for the safety, security, health and welfare, mentoring, counseling, leadership development, discipline and accountability of the cadets assigned to their troop. The cadet is responsible for helping every cadet realize their full potential by maintaining a positive leadership environment in which every cadet can achieve academic excellence, become a leader of character and develop a desire for lifelong physical fitness. A TLA plays a crucial role in interacting with cadets on a daily basis to develop the “whole person”. The Troop Leadership Advisor (TLA) is a key member of the Commandant’s staff and the individual most knowledgeable of each cadet and the activities that the cadet is involved with on campus. The TLA directly supervises the leadership development of those cadets assigned to the Troop and focuses on the maintenance of good order, discipline, and daily cadet life within their troop. The TLA enforces regulations, policies, and procedures directly impacting the morale, welfare, administration, activities and training of up to 80 cadets. The TLA works to cultivate a positive rapport and regular communication with cadets, parents, guardians and members of the faculty and staff. New Mexico Military Institute provides a rewarding yet demanding learning environment which focuses on the “whole person.” Not everyone who applies can meet the challenges of the NMMI experience. Adherence to established standards by all cadets is at the core of leadership development and those standards must be met in order to remain a NMMI Cadet. The Institute reserves the right to dismiss, suspend, or otherwise penalize any cadet who does not properly adapt to academic, discipli nary and/or physical readiness requirements. Among the offenses that may result in suspension or dismissal are those considered to undermine the purposes, goals and mission of the Institute and compromise the standards of character and conduct expected of all cadets. These include: hazing or endangerment of any cadet; sexual misconduct; disgraceful or refractory behavior; use or possession of illegal drugs and drug paraphernalia and misuse of prescription drugs; alcohol or tobacco products; possession of weapons, knives or explosive devices; unexcused absences; or any conduct that may bring discredit upon the Institute. NMMI Policy documents, Commandant Policy letters, the Blue Book, and the NMMI Operations and Procedures Manual provide in detail the policies pertaining to the aforementioned offenses. Lesser offenses will result in demerits, marching tours (punishment), loss of privileges and/or restriction to the campus. An excessive number of demerits is regarded as a failure or inability to adjust satisfactorily to the NMMI standards and may result in disciplinary probation or suspension. Poor academic performance may also result in academic probation or suspension. All cadets are categorized as either RATs (Recruits at Training), New Cadets, Yearlings or Old Cadets as part of the traditional New Cadet/Old Cadet system. Cadets are RATs for the first six weeks of their first semester at NMMI. At the six week mark, all RATs become New Cadets and continue their training as the newest members of the Corps of Cadets. Yearling cadets (second semester in college or second year of high school) continue to hone their management and leadership skills. They may be given supervisory responsibilities over new cadets. During this period, cadets are carefully coached, mentored and evaluated by adult Troop Leadership Advisors on their management skills, leadership and character development. Old cadets (at least one year college or two years high school) are the primary leaders in the Corps, having the responsibilities of training the new cadets, monitoring and helping the progress of the yearlings and running day-to-day Corps operations and activities. Their performance is periodically assessed through leadership development and training exercises. They are expected to lead by example and enforce the school standards outlined in the Cadet Blue Book. All full-time cadets are required to be resident members of the Corps of Cadets. Every cadet wears the cadet uniform and participates in leadership education training (LET) or military science (MSL), and physical training (PT) activities. The normal repeat policy for NMMI is to grant credit only for the highest grade. However, if a cadet taking a college course is found in violation of the honor code by cheating, the cadet will receive a grade awarded by the instructor (normally an “F” grade) for that course. Any repeat of that course will be assigned both grades (no academic forgiveness) for the GPA. Thus a cadet may receive both the “F” and any subsequent letter grade earned. A furlough is a designated and authorized time when a cadet may leave NMMI overnight. Authorization for furloughs is directly related to class status, activities on the training schedule, academic grades and deportment grade. A cadet whose grades or deportment fall below a “C” average loses their furlough privilege. Furloughs are taken only on specific weekends designated by the Commandant of Cadets. There are three major furloughs during which all cadets must leave NMMI: Thanksgiving, Christmas, and Spring Break. The barracks and facilities are closed during these extended break periods. The Outdoor Fitness Factory (OFF) is a world class facility that accommodates the large volume demands of the Corps Physical Development program, while providing unparalleled exercise variety. It features a wide range of training venues that facilitate optimal physical development. The Outdoor Fitness Factory accommodates the multiple training needs and philosophies of all campus groups such as Corps PT, Academy Prep PT, SROTC PT, and the Bronco/Colt Athletic Teams. The OFF is truly innovative featuring 2 sand pits, a Speed Hill @ 3% grade, 56 Multi-stations, a Medicine Ball Wall and Vertical Power Station, 4 Inverted Bear Crawl Standards, 1 Platoon Trainer - Mobile Exercise Station, along with numerous other pieces of equipment including barbells, medicine balls, kettle-bells, sand bags, water filled kegs, tractor tires, weighted barrels, power sleds, elastic bands, weighted belts, and plyo-boxes. The Athletic Training Education Center (ATEC) provides top level physical rehabilitation and treatment facilities for cadets suffering from sports related injuries. The ATEC sets the standard for facilities and treatment at this level. The ATEC serves primarily athletes, but is also available as a resource to cadets. Additionally, ATEC functions as the primary education center for cadets wishing to pursue a career in the athletic training and sports medicine fields. The recently completed center offers the highest quality cutting edge therapeutic modalities under the direction of two full-time athletic training professionals. NMMI fields high school interscholastic teams that compete in the New Mexico Activity Association (NMAA) and the “AAA” and “AA” level in the following sports. The NMMI Cadet Store, located in Bates, has everything for current cadets and alumni. All required textbooks for NMMI courses are stocked as well as a full line of military uniforms and accessories. 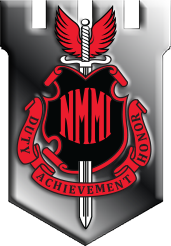 A collection of NMMI logo apparel and gifts, school supplies and computer accessories are available. Laundry and dry cleaning services are also offered through the Cadet Store. Visit the Cadet Store in Bates Hall or contact them at (575) 624-8215. The NMMI golf course is a regulation 18 hole facility, equipped with a large driving range and putting green. The course plays 6639 yards from the back tees, 6315 yards from the middle tees, and 5275 yards from the forward tees. The greens are bent/poa annua and are usually fast. We over-seed in the fall to provide the golfers with lush green fairways, tees, green aprons. Sodexo runs the dining facility, Post Exchange (PX) snack bar and Game Room snack bar and lounge. Sodexo’s dining webpage can be accessed at https://nmmi.sodexomyway.net/. The NMMI Bowling Alley is located in Hinkle Hall, provides 10 lanes, with sound system and cosmic bowling available. NMMI’s Internet Café/Game Room is located in Hinkle Hall. It provides wireless Internet service, a game room which includes Xbox games, a Pool Room, and 42” plasma TV’s for cadets. The NMMI Barbershop is located in Hinkle Hall and open five days a week. Two barbers/cosmetologists are employed at the Barbershop to provide professional service. NMMI’s Post Office is located on NMMI campus in Hinkle Hall and provides services to all cadets and NMMI administrative offices. The campus Marshall Infirmary has a capacity of 38 beds and the capability of treating cadets for minor illnesses and injuries. A nurse is on duty 24 hours a day and is available during the school day and for sick call. Morning sick call begins at 7:00 a.m. Monday through Friday. Routine medical and dental care should be arranged by you during school breaks with your local provider. Minor illnesses are treated or referrals are made to Roswell physicians if deemed necessary by the medical staff. There is no charge for an office call or for confinement in the Infirmary. However, you will be billed for any lab tests. Prescribed drugs are charged to the cadet account; copies are available for insurance purposes. In instances of sudden serious illness or accident, cadets are transported to a local hospital in Roswell. All NMMI cadets reside in the barracks. The Hagerman Barracks, “The Box”, are where the majority of cadets call home. The first section was completed in 1909 at a total cost of $50,000. The second section was completed in 1925. The Hagerman Barracks are named in honor of James J. Hagerman, one of the great industrial frontiersman of the west who has frequently been identified as a primary force behind the economic development of the Pecos Valley. In 1895 J.J. Hagerman donated 40 acres of land, none of which could be sold in any portion, for NMMI’s permanent home. The Cadet Counseling Center (CCC) provides cadets advice, counsel, and encouragement in the areas of human interaction, interpersonal relationships, personal growth, spiritual growth, social awareness, and intellectual achievement. It provides cadets with a person who will listen and give feedback on a wide variety of issues. CCC is located in JRT near the PX. The personnel of the CCC help the cadets deal with family matters, roommate problems, tobacco/alcohol involvement, homesickness, personal attitude, Corps life, authority, ethical/moral issues, depression, anxiety, eating problems, isolation, conformity to discipline and basic adjustment problems. If the cadet needs more specialized or long term counseling than the Cadet Counseling Center can provide, referrals are made to appropriate medical, legal or social professionals at the Cadet’s expense. Psychiatric services are not available through the CCC. The CCC is part of the Commandant’s Crisis Action Team, a team of various professionals who work together in the event of a crisis. They also are available to counsel cadets in the case of death in the family, loss of home to fire, or various other crises which may arise. The CCC staff maintains close cooperation and coordination with the Academic Advisors, Commandant’s staff which includes the Deputy Commandants for Operations and Support, Squadron Officers and most importantly Troop Officers, Staff and Faculty, and Cadet Regimental Staff in addressing concerns of the cadet’s educational, social, and personal development. Each week the CCC staff, the Commandant, and the Deans meet or exchange information to identify ways to help cadets succeed. The Daniels Leadership Center (DLC) is a unique learning, instructional and experiential catalyst for the New Mexico Military Institute. Under the direction of the Commandant of Cadets, the Center is charged to advance the NMMI mission to educate, train and prepare young men and women to become leaders of character by supporting its academic and leadership curriculum that falls under the Dean of Academics. The focus of this effort derives from the unique nature of NMMI with its six-year integrated secondary and post-secondary learning curriculum and programs. This enables the Center to concentrate on cadets at the junior high and high school age level, as well as the junior college, in order to engage them in formal and experiential leadership learning. The Center sponsors a variety of programs to include conferences, workshops, lectures, round-tables and summer camps. Integral parts of the Center are the Yates Leadership Challenge Complex and the Performance Enhancement Laboratory (PEL). The Complex is divided into two experiential courses that emphasize character and leadership development. The PEL is patterned after the Army’s Center for Excellence in Performance (ACEP) at the United States Military Academy at West Point (USMA). NMMI’s PEL expands on that concept by offering unique and exciting training and learning opportunities for cadets. Using performance psychology training techniques, cadets learn how to use the tools of goal-setting, imagery, self-talk and visualization to enhance the skills of motivation, concentration/focus, self-confidence, stress management and arousal control to help perform optimally. Under the supervision of a professional with a Ph.D. in the Performance Psychology field, the PEL combines the best practices of traditional training along with the latest cutting edge science to accelerate the individual’s progress and ability to perform at one’s peak. The Leader Development Personnel at the DLC work closely with the staff and faculty in assessing the leadership development that occurs within the Corps of Cadets and through the entire NMMI experience. The Alumni Memorial Chapel was dedicated 15 May 1975 to those who gave their “Last Full Measure of Devotion,” NMMI alumni who lost their lives in military service, fighting to preserve the freedoms we now enjoy. Their names and graduating classes are listed on the main bronze plaque in the Memorial Narthex. Contributions from hundreds of alumni and friends of NMMI funded the construction of the building. Lieutenant Colonel L.T. “Babe” Godfrey, Class of 1924 was both the spirit and leader of the effort for the chapel. Through his leadership and the efforts of many others, the Corps has this beautiful house of prayer. The chapel is located at the entrance to the campus as a solid statement of NMMI’s philosophy that spiritual development is necessary for a complete education. As such, it is the spiritual center of the life of the Corps of Cadets. The chapel serves as a worship center for Catholic, Protestant, Muslim, Jewish and other faith groups represented in the Corps. The chapel and the chapel garden are quiet places of refuge in the midst of an otherwise hectic cadet life. Cadets come to sit in the chapel or memorial garden to study, talk quietly with friends, meditate, and pray. All catalogs © 2019 New Mexico Military Institute. Powered by the Acalog™ Academic Catalog Management System™ (ACMS™).